Female The only British species of the genus. Common across southern England and the midlands, less frequent further north to Durham and the Isle of Man, in Wales only from the southeast; Glamorgan, and apparently absent from Scotland. Hostplants are various species of mallow; common mallow (Malva sylvestris) and dwarf mallow (M.neglecta Aall= M.rotundifolia auct non L. as quoted in Fowler) where the larvae develop within the seed pods. Around Watford the species is local and sporadic although where found there is usually a healthy population. 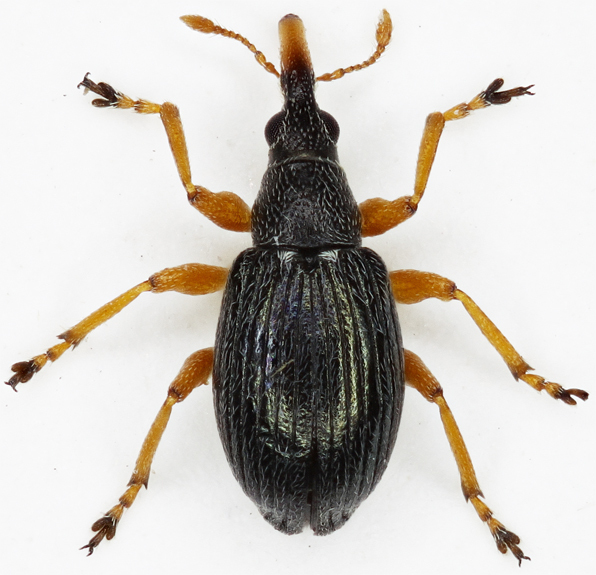 We have recorded adults from M.sylvestris aloing the Grand Union canal from Cassiobury park to Croxley lock and from the eastern (dry) side of Common moor during May, June and July; certain plants may host the weevil and often in numbers while adjacent plants do not and so some patience is needed when looking for them. 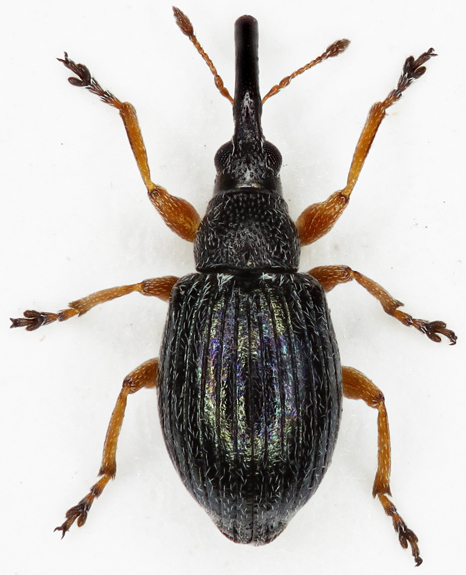 Often, or usually, they occur among populations of other mallow feeding weevils eg Aspidapion aeneum, Aspidapion radiolus or Malvapion malvae. So far (July 09) we have not recorded the species elsewhere around Watford and in recent years the hosts seem to be less common, more especially so with the disappearance of waste ground around the town; M.sylvestris is common along the river Colne from the high st. to the A41 and we have swept and beaten plants here through several summers without finding the weevil. When found on the host the dark body and yellow legs are distinctive.